Sylvan Barnet, professor of English and former director of writing at Tufts University, is the most prolific and consistently successful college English textbook author in the country. His several texts on writing and his numerous anthologies for introductory composition and literature courses have remained leaders in their field through many editions. Hugo Bedau, professor of philosophy at Tufts University, has served as chair of the philosophy department and chair of the university’s committee on College Writing. An internationally respected expert on the death penalty, and on moral, legal, and political philosophy, he has written or edited a number of books on these topics. 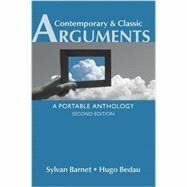 He is the author of Thinking and Writing about Philosophy, Second Edition (Bedford/St. Martin’s). *4 College Education: What Is Its Purpose? 5 The Death Penalty: Is It Ever Justified? 6 Drugs: Should Their Sale and Use Be Legalized? *7 Facebook: How Has Social Networking Changed How We Relate to Others? *Lauren Tarshis, Is Facebook Making You Mean? *8 Genetic Modification of Human Beings: Is It Acceptable? *9 Immigration: What Is To Be Done? *10 Service: Should the United States Require Young People to Perform Public Service? *Peter Levine, The Case for "Service"
*11 Student Loans: Should Some Indebtedness Be Forgiven? *Kayla Webley, Is Forgiving Student Loan Debt a Good Idea?